F.R. 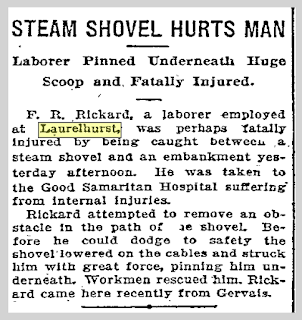 Richard, a labor employed at Laurelhurst, was perhaps fatally injured by being caught between a steam shovel and an embankment yesterday afternoon. He was taken to the Good Samaritan Hospital suffering from internal injuries. Richard attempted to remove an obstacle in the path of the shove. Before he could dodge to safety the shovel lowered on the cables and struck him with great force, pinning him underneath. Workmen rescued him. Rickard came here recently from Gervais. James L. O'Donnell, a general contractor 46 years of age, committed suicide by shooting himself through the head with a 38-caliber revolver in a portable office chair, at 41st and Stark Streets, Laurelhurst, shortly after 7 o'clock last evening. Death resulted almost instantly. O’Donnell is known to have been mentally depressed because of impending financial reverses during the past several days. 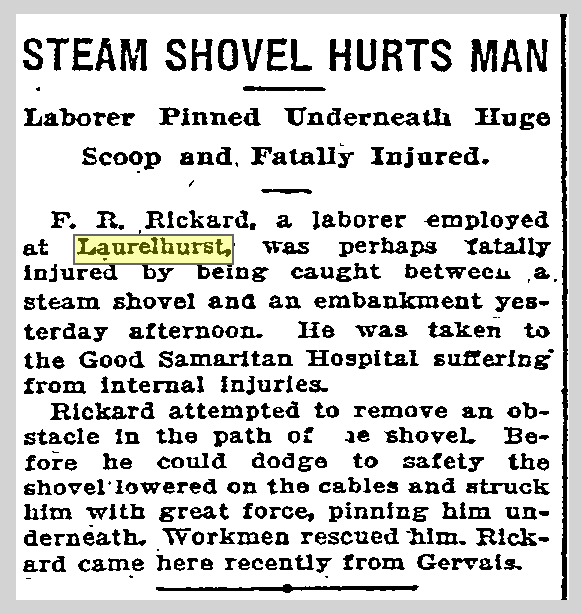 He had the contract for grading and paving streets and boulevards in Laurelhurst. With the aid son John, 25 years of age, who super-intended the workmen O'Donnell has endeavored to fulfill his contract and was rushing the work to completion despite his reverses. O'Donnell was observed to be acting queerly by several members of his family yesterday. Soon after 6 o'clock last evening he left his wife and children in a happy frame of mind. An hour later, after reaching Laurelhurst, he went to the improvised office, spoke to his son John, who, with an employee sat outside then stepped inside and apparently began immediate arrangements for his self-execution. Taking an old rusty revolver out of a drawer, where it had lain for five years, O'Donnell placed the weapon to his right temple sent the bullet through his head. The report was heard by a half hundred employees. John O‘Donnell found his father lying on the floor, weltering in blood. O'Donnell was born and raised in Portland. He is survived by a wife and six children, the eldest of whom is John. At the O'Donnell home, 843 East Stark street, no one could assign a motive for the suicide.